It's always exciting and an honor to create custom crystal jewelry whether it be for brides, weddings, prom or senior ball! 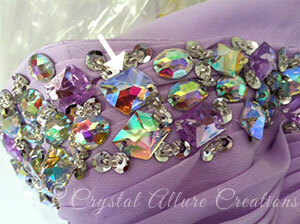 Recently, a lovely young lady, Courtney, requested a jewelry set to compliment her lavender prom gown. 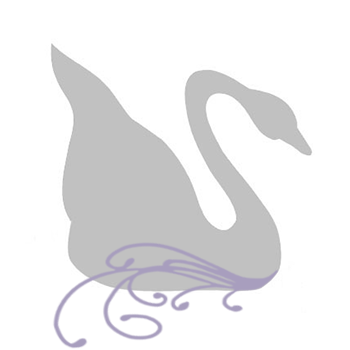 In our initial conversations, she mentioned the dress was a sweetheart neckline and was lavender in color. I suggested with that type of neckline, a drop necklace always looks nice. Of course, chandelier earrings are always stunning! It wasn't until weeks later that I was able to finally see the dress...and I was a little surprised. The dress was loaded with crystals on top! Courtney had never mentioned the top of the dress was that embellished. This was going to be a challenge. But, I love a challenge! I gave some style advice that with a dress that embellished, it's always a better option to go with a nice pair of chandelier earrings and maybe a cuff style bracelet. But...the customer had other ideas. She was set on a necklace. Finishing off her outfit were silver shoes. Courtney told me she would not only be wearing them to her prom and her boyfriends' senior ball (a week later), but also to an August wedding she is in! Now that is getting your use out of one pair of shoes!! You go girl! 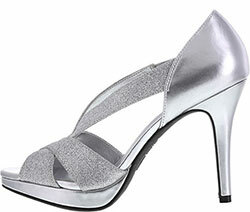 The shoes were absolutely lovely and were perfect for the sterling silver metals I planned on using in the jewelry pieces. Armed with this information, I focused on the detail at the top of the dress. It took me many, many times to get a decent enough photo to showcase the variety of crystal cuts in the top. Of all the crystals in the top of the dress, none of them were true Swarovski Crystals, so it was unlikely I'd find anything like them to create complimentary jewelry. 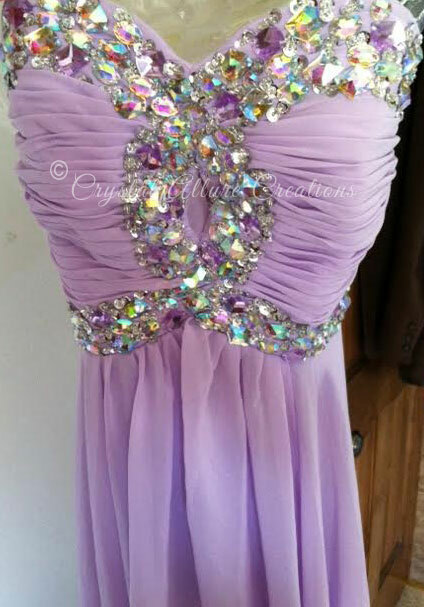 So, I instead focused on (1) the lavender color of the gown and; (2) the cut of one crystal on the top of the dress (see the arrow in the picture to the left). The closest Swarovski Crystal bead cut would be the Cosmic Crystal. Stay tuned for the fully finished prom jewelry set, along with Courtney's Prom pictures. Thank you Courtney for allowing me and Crystal Allure Jewelry to be a part of your special prom day. Browse more Custom Prom Jewelry and then contact me to discuss a custom design for your special event.